Primarily known for constructing high end tools, Lezyne also creates saddle bags of exceptional quality. The S-Caddy is no exception. With Velcro straps that attach to the saddle rails and seat post, your S-Caddy seat bag isn't going anywhere. The water resistant zipper and durable woven nylon fabrics help to fend off the elements. Attach a tail light to the tail light loop conveniently located on the saddle bag. The main compartment features neoprene pockets that help you to organize your flat repair tools, money, and ID. The external multi- tool compartment, makes grabbing your multi- tool easy and fast. 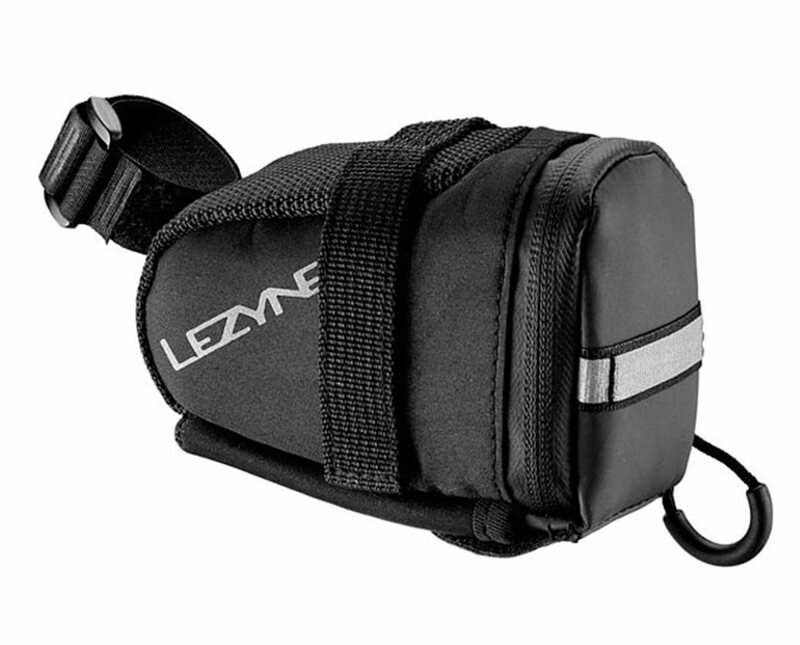 The Lezyne S-Caddy Seat Bag is for riders who don't require a luggage bag to get out and pedal. I have no idea what thorn-resistant, burley, gaper-tube the other reviewer uses, but I EASILY fit a tube and a patch kit in the main compartment with room for tire levers (if you use such things). That leaves the bottom Velcro pouch for my mini tool. These are great bags that are easy to get on and off, are super secure, and look slick. I have one on my 'cross bike and one on my road bike and I'm at Jenson today to buy another FOR MY 27.5 MTB BIKE (because, you know what, even a spare 27.5 tube fits!). It’s called a small caddy bag as in it carries things for you. Not to imply it has the space of a Caddy’s trunk. I fit a spare tube, a couple levers, a patch kit and a small bottle of chain lube in the main compartment and a multi tool in the bottom pocket. Everything fits fine. If I gripe, it has some internal pockets that take up space and are hard to use.